The Angriest: Highlander: The Series: "Innocent Man"
It's 10 October 1992, and time for another episode of Highlander: The Series. 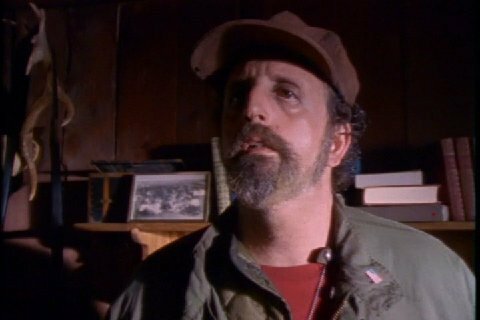 Homeless veteran Leo Atkins (Vincent Schiavelli) is in the wrong place at the wrong time when he stumbles upon the recently decapitated corpse of an immortal. Framed for the crime by local sheriff Howard Crowley (John Novak), he must rely on a visiting Duncan Macleod (Adrian Paul) to demonstrate his innocence. The late Vincent Schiavelli is one of those beloved fixtures of cult and genre cinema that his mere presence alone seems to demand that "Innocent Man" deserves praise. In a long career he appeared in such films as One Flew Over the Cuckoo's Nest, Fast Times at Ridgemont High, Buckaroo Banzai, Amadeus, Ghost, Batman Returns, Lord of Illusions, Tomorrow Never Dies, and Man on the Moon. The temptation is there to simply shout 'Vincent Schiavelli, it's great, shut up', and call the review a day. The truth is that even with Schiavelli's presence, "Innocent Man" marks a solid step up in quality from the three previous Highlander episodes. There is an actual narrative worth caring about: one immortal has moved into town as its new sheriff in order to murder another - a country-living recluse. The victim was a friend of Macleod's - as demonstrated through the obligatory flashback sequences - and that motivates Macleod to investigate. The sheriff has his own posse of 'you ain't from round here, are you boy?' thugs and miscreants to make life difficult for the hero. It's not groundbreaking stuff by any definition, but there's enough here to fill 45 minutes and certainly more than usual to engage and entertain its audience. The episode's flashback takes the story to post-Civil War America, with a very well shot and lit encounter between Macleod and Crowley's future victim. It's emotionally effective and impressively staged, and does exactly what these flashbacks are supposed to do: enrich character and echo themes. The guest cast is essentially workmanlike, but they do what they need to do without too many weak links. A few of the local ne'er-do-wells are a little unconvincing, but don't unnecessarily damage anything. This episode was produced fourth, but rescheduled to follow the series premiere. It's easy to see why: this is solid, entertaining TV drama of a quality the three already-produced episodes could not match. It does still leave Highlander four episodes in with a quality ratio of just 25 per cent, but at least it's scored a point on the board. Hopefully it keeps improving from here.